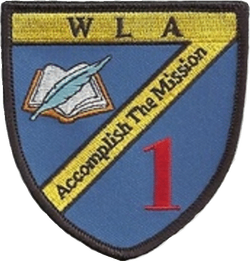 WLA's annual silent auction will be held April 27th from 4-6 PM at the 1st Battalion Gymnasium. This year, it will be combined with a talent show to showcase the many unique talents of our cadets from both battalions. Click the button bellow for a list of some of the items appearing at our auction! WILLAMETTE LEADERSHIP ACADEMY RECEIVES DONATION OF $5,000 FROM McDONALD’S RESTAURANTS OF EUGENE! Click the press release button below for more details. Congratulations! to our First Battalion cadets who won awards at the Cesar Chavez celebration with their artwork!! Please check here for up to date information on any school closures or delays. Have a safe and wonderful day. "ASPIRE is the State of Oregon's mentoring program to help students access education and training beyond high school,"
"The ASPIRE program provides one-on-one mentoring to help students continue their education beyond high school. Adult volunteers meet with assigned students to assist them with a variety of activities such as academic preparation, scholarship search and application, career exploration, college choice, and college application. All volunteers are screened, including a criminal background check." Check out https://oregonstudentaid.gov/aspire.aspx for more information. Please contact the 1st Battalion office or CPT Johnson at jjohnson@wlacademy if you are interested or know someone who is. Also at Second Battalion, for more than 7 years WLA has participated in a fundraiser for the Leukemia and Lymphoma Society. The money is used by the LLS to fund research, education, treatment, and cures relating to blood cancers. We asked students to collect change during the month of February and bring it to their company. The company raising the highest total earns a lunch catered by Olive Garden. Foxtrot is the company that won the lunch catered by Olive Garden. We are so proud of our students for pitching in to help others. WLA is raising cadet attendance this year. We have prizes at the Battalion and Company level. Two weeks ago, at Second Battalion, ECHO CO. set a goal to have 94% attendance or better for 5 days. They hit their goal this week on Wednesday! The reward they chose was ART STATIONS, involving: origami, string art, painting and more. Today we celebrated their commitment to attendance by getting artsy! We are setting a larger goal for after spring break. GO KNIGHTS! Results of water supply test for traces of lead here. Join the Parent Student Association (PSA) as we plan activities, fundraisers, and problem solve in partnership with Willamette Leadership Staff. Please email wlapsa@wlacademy.org for more information. As a 501(c)(3) non-profit organization we are constantly in need of donation support. We are in need of basic school supplies, academic resources, sports equipment, building maintenance supplies, decorations and advertisement for events and fundraisers. All donations are tax deductible. The Willamette Leadership Academy is staffed by employees of the Pioneer Youth Corps of Oregon Inc. education corporation and uses the PYCO program.